Joshua loved to look at himself in the mirror at least a dozen times in a day. But this was before a rare cancer affected his left eye. He does not know what he looks like any more. 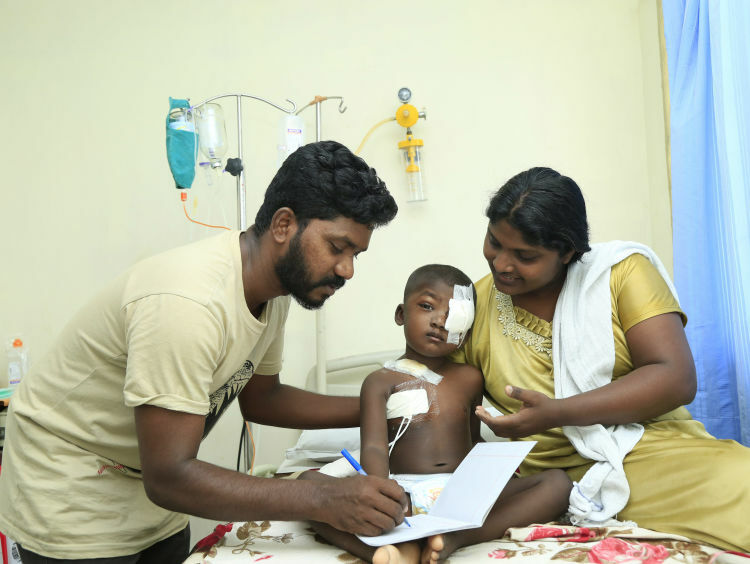 His parents, Susan Jacob and Jacob John, have a hard time recognizing him too because of the bandage on his eye that covers almost half his face. He is weak and does not talk much; drastically different from his earlier playful and talkative self. All he does now is cry of pain due to the numerous injections he gets in a day and stare at boardgames with one eye because he is too weak to play with them. When Joshua complained of leg pain in July last year, his parents told him to sit more because their second child was always on the move. He would spend his time playing and running around the house, and never rest. But they understood that it was something to be taken seriously when he got a fever that persisted for two weeks. “He would be normal in the mornings, but wouldn’t sleep at night. Seeing him turning and tossing restlessly really worried us. When we took him to the doctors at first, they didn’t suspect anything. But more tests confirmed he had cancer. We were devastated. Our son had just begun talking in complete sentences. He was growing up to be a smart toddler. 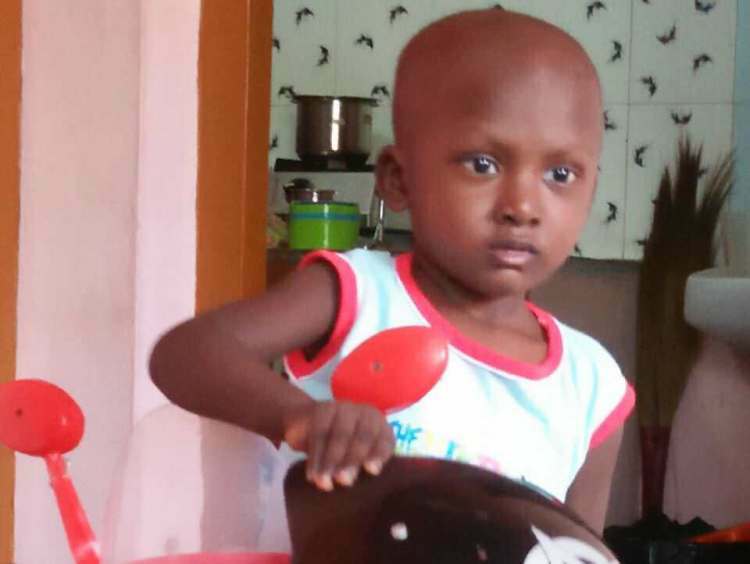 We couldn’t believe it but the truth was that cancer had come for my son and we had to face it,” says Susan, Joshua’s mother. Contrary to the worried family’s fears about losing their dear child to cancer, Joshua was actually responding well to chemo. “He was tired but it never stopped him from smiling. He still wanted to play. That’s the wonderful thing about children – their natural resilience. Our Joshua had been almost cured of cancer and was excited about going to pre-school when the relapse happened in January,” says Jacob, his father. Only this time, the cancer caused a huge bulge in his left eye – causing immense pain and irritation. Joshua’s parents were too shocked to say anything when the doctors told them that the cancer was spreading. 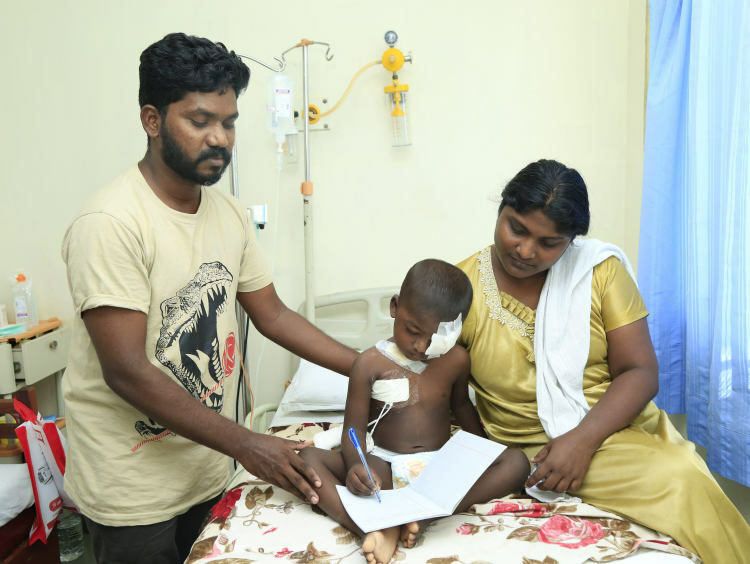 He needed immediate chemotherapy and his family rushed him to a hospital in Madurai for treatment. 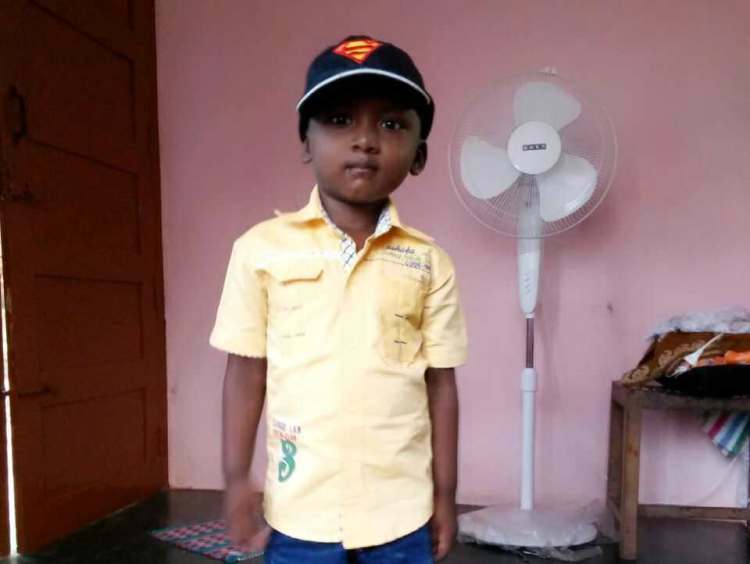 They had to leave behind their first child – 6-year-old Rusef in their hometown, Kottayam. Joshua has become more irritable than ever now because of the chemo. He sleeps more often and does not eat much. “My child loved dosa so much. Now, he is not even able to eat a morsel of rice congee. We have to feed him forcefully. We tell him that he will not be able to be strong without the food. When we say the same for the injections he receives, he cries and says he doesn’t want to get better like this. The worst part is when he asks about his eye. He wants to see himself in the mirror, but we have been giving him excuses. Our son may lose his eye, but we don't want him to lose his life,” adds Susan. Joshua loved singing verses from the Bible as his father is a pastor. He may not be able to sing now but his mother is making sure she reads stories to him every day. 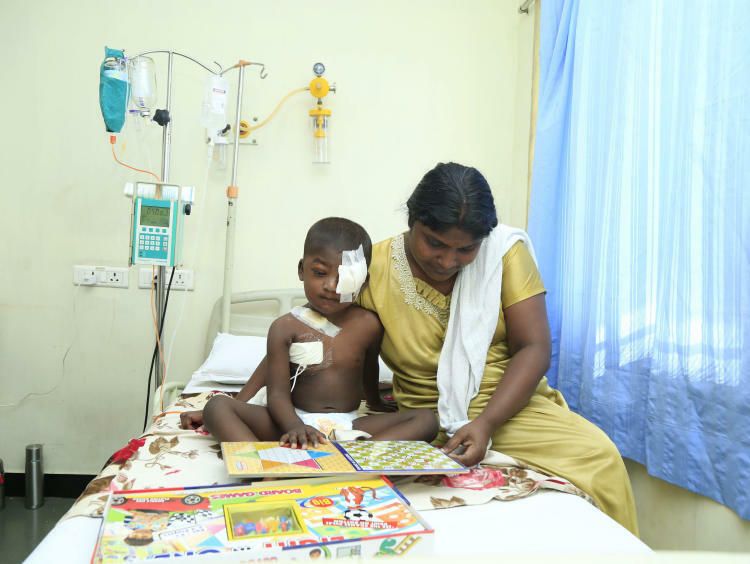 His parents also try to divert his attention from the pain by bringing him different books to go through. He finds it difficult to peruse but it puts a big smile on his face. 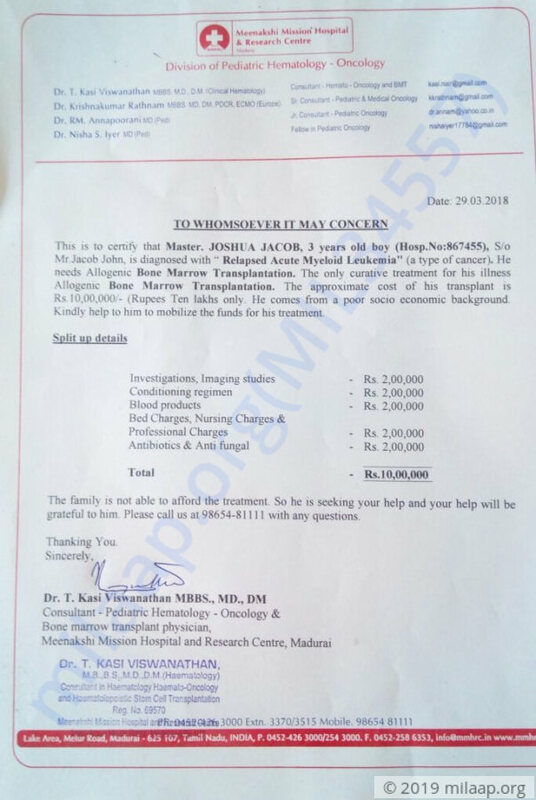 Joshua needs an immediate bone marrow transplant before his cancer aggravates and spreads to other organs. His left eye may lose its vision completely and worse- he may even lose his life- if this surgery is not done urgently. 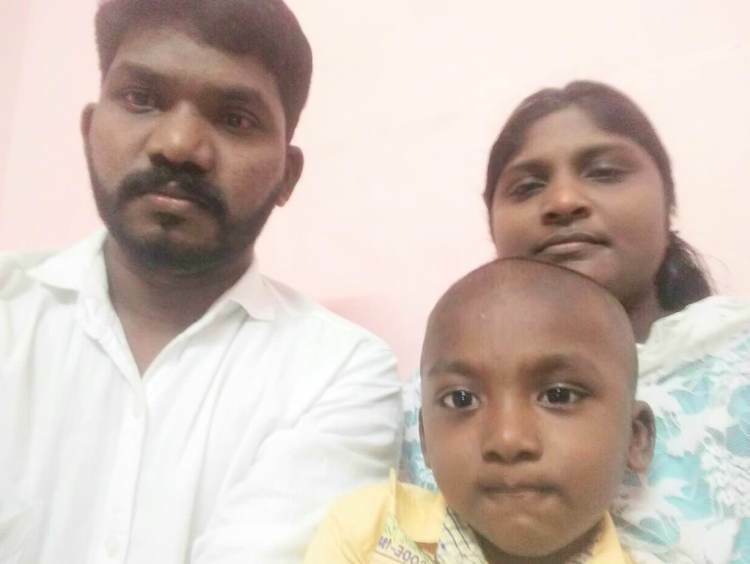 Joshua’s father, Jacob John, works as a pastor in a small church in Kottayam and cannot arrange the money – Rs 10 lakh – required for the treatment. He has spent only Rs 50,000 till now at the hospital because that is all he could afford. Your small contribution can help save Joshua’s life. Joshua Jacob case of relapsed Acute Myeloid Leukemia was receiving reinduction chemotherapy. During the severe neutropenic period, he succumbed to severe gram-negative bacterial sepsis that was resistant to multiple injectable antibiotics. He because sick and unfortunately we had lost him on 10.04.2018. We thank for your kindly and needful help towards the child.